In this small book, individuals or study groups can delve into Wesley’s admonition to “gain [or earn] all you can, save all you can, give all you can.” With help from the book’s discussion questions, it prompts readers to realign their daily habits. Earn all you can, says Harnish, but not by harming your health, hurting your neighbor, or damaging your soul. Work at your livelihood supported by your Christian community and financial counselors, trusting God in the process. “Save all you can” means not to waste money on things that derail us from our relationship with God. Here the author offers eight real-life steps we can take to counter our instant-gratification, credit card-addicted culture. 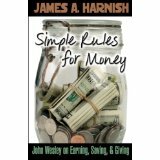 “For Christ-followers,” Harnish says, “giving is a defiant act of rebellion against the insatiable power of greed.” Wesley’s phrase “give all you can” is not about giving from our financial leftovers, but “a total reorientation of our financial life around our commitment to Christ.” He then highlights Wesley’s four challenging questions to ask ourselves before we make any expenditure.